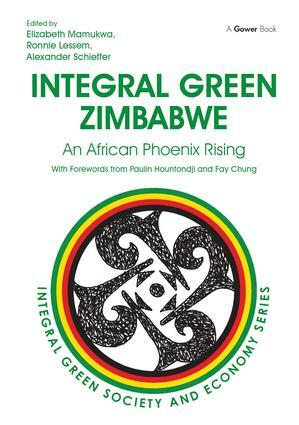 Integral Green Zimbabwe: An African Phoenix Rising by Ronnie Lessem, Alexander Schieffer and Liz Mamukwa is the first book in the Integral Green Society and Economy series, a series which has three overarching aims. The first aim is to link together two major movements of our time, one philosophical, the other practical. The philosophical movement is towards what many today are calling an 'integral' age, while the practical is the 'green' movement, duly aligned with that of sustainable development. The second is to blend together elements of nature and community, culture and spirituality, science and technology, politics and economics, thus serving to bring about an 'integral green' vision, albeit with a focus on business and economics. As such, the authors transcend the limitations to sustainable development and environmental economics, which are overly ecological, if not also technological, in orientation, and exclude social and cultural elements. Thirdly, this particular volume focuses specifically on Zimbabwe, as well as Southern Africa, drawing on the particular issues and capacities that this country and region represents. The emphasis on Zimbabwe and Southern Africa transpired not only because two of the editors (Lessem and Mamukwa) are Zimbabwean in origin, but because Zimbabwe is today like a phoenix rising from the ashes, and has the opportunity to recreate itself anew. Dr Alexander Schieffer studied economics, business administration, law and social sciences at the University of St Gallen, Switzerland where he also gained a Doctorate in Leadership. Professor Ronnie Lessem is a graduate of Harvard Business School and the London School of Economics. He has been an adjunct professor at IMD, Lausanne and is now Director of the Trans-cultural Centre and programmes at the University of Buckingham, UK. Both run doctoral programmes at Bethel University and Buckingham University. They are co-founders of the Geneva-based TRANS4M Four World Center for Social Innovation. Elizabeth Mamukwa is HR Director at Turnall Holdings Ltd. Her career is mapped by 12 years as a high school teacher, 13 years of human resources work, and seven at senior management level. She holds an MBA from Nottingham Trent University and a Bachelor of Arts degree from UNISA.